I tried to google quotes involving “simplicity” and found myself immediately overwhelmed. Anyways, I was just looking for an elegant way of saying that simplicity can sometimes be a lovely thing. There. That wasn’t so hard, now was it Katie? I don’t need a famous person to agree with the statement that simplicity can be lovely. I must need some more caffeine today. Anyways, a few nights ago I wanted something sweet to round out my evening. My freezer door had accidentally been left open a few nights previous, and I’d had to throw out all my ice cream. And that is a sad experience. I had no sweet treats in the house! No cookies or brownies or ice cream. 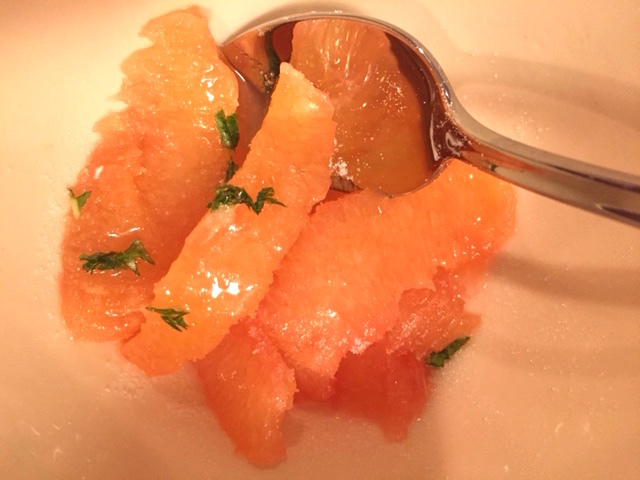 But I did have one sad little grapefruit on the counter that I had purchased the week before in one of those surges of good intentions where I was sure I’d start waking up earlier to eat healthy breakfasts. Obviously, that hadn’t happened or the grapefruit would not have still been on the counter. I don’t know about anyone else, but I have a hard time getting up any earlier in the morning than I have to. I want to get up in just enough time to get ready and out the door. Most mornings, I’d rather hit the snooze button than sit at the table with half a grapefruit and read the news. But I have to say, when I do, I feel like a real grownup. So there I am, looking for a treat, seeing the lone grapefruit and figuring, why not? And really, I should do this more often. 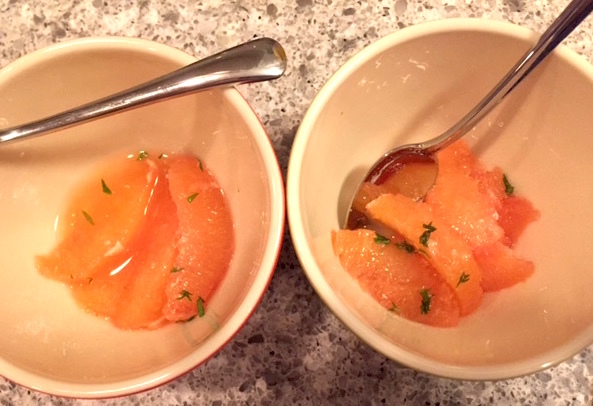 I segmented the fruit, tossed it with plenty of white sugar (it was very tart), and clipped some fresh mint from my front yard over the top. And it was a delightful, palate-cleansing, pre-bedtime treat. If you don’t know how to segment citrus fruits, check out this simple video. It isn’t a hard process, but just one that feels like a lot of trouble for some reason. It’s really not. I promise. No recipe here. 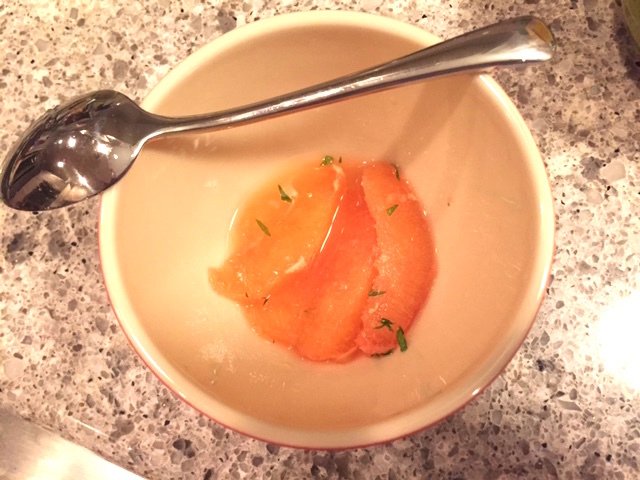 Segment grapefruit, season with sugar to your preference, fresh mint. Yummy.